Although it’s rare, you may need to change the pneumatic lift on your chair. If you find that the lift is leaking and slowly lowers throughout the day, the lift is old and bounces too much/sinks too much when you sit, the lift no longer adjusts at all, or it is not the appropriate size (too high or low), you should consider replacing it. Changing a pneumatic lift is simple – there are no nuts or bolts, no glues or adhesives, only pressure. 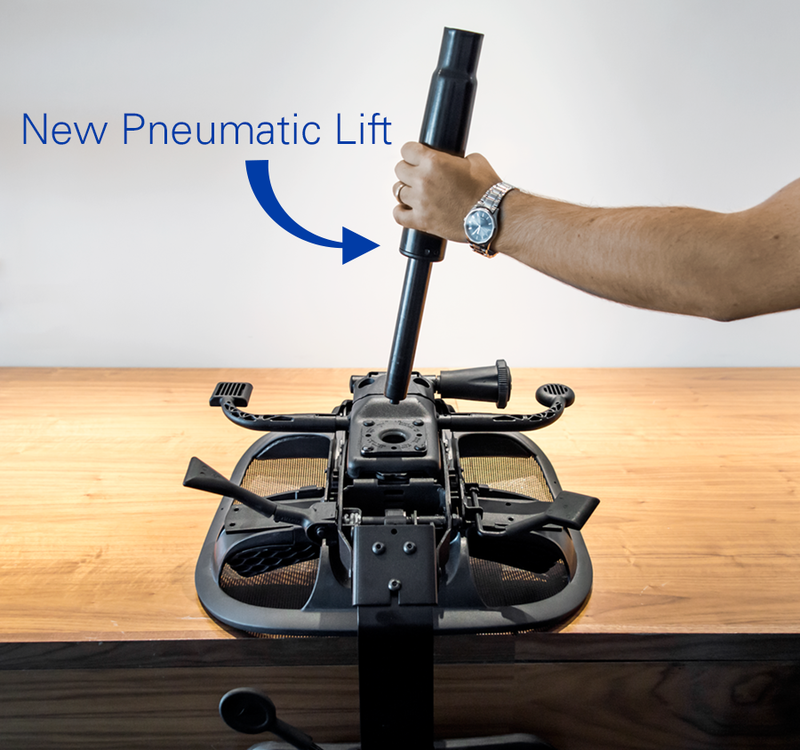 The pneumatic lift is attached to two other parts of your chair – the mechanism (metal part under the seat) and the base. And they are both pressure fitted to the lift. Flip your chair upside down and remove the base from the lift. The base is sitting around the pneumatic lift very tightly, so to remove it, you have to knock the lift out of the base using a hammer. Grab the base and hold it up, so the weight of the chair is pulling down while you pull up on the base, then hit the bottom of the gas lift with a hammer as hard as you can. The goal is to dislodge the lift from the base, so try holding it from different legs on the base, and always hit the lift on the edges/lips of the end, not in the center. There is a clip in the center of the lift that holds it together. If you hit the center clip, the lift could break into two pieces, which will make it very difficult to remove from the mechanism. Once the base has been removed from around the lift, the lift must be removed from the mechanism. Like the base, the lift is wedged into the bottom of the mechanism using pressure, and must be dislodged. Put the chair upside down on a stool or another chair so the lift is sticking straight up. 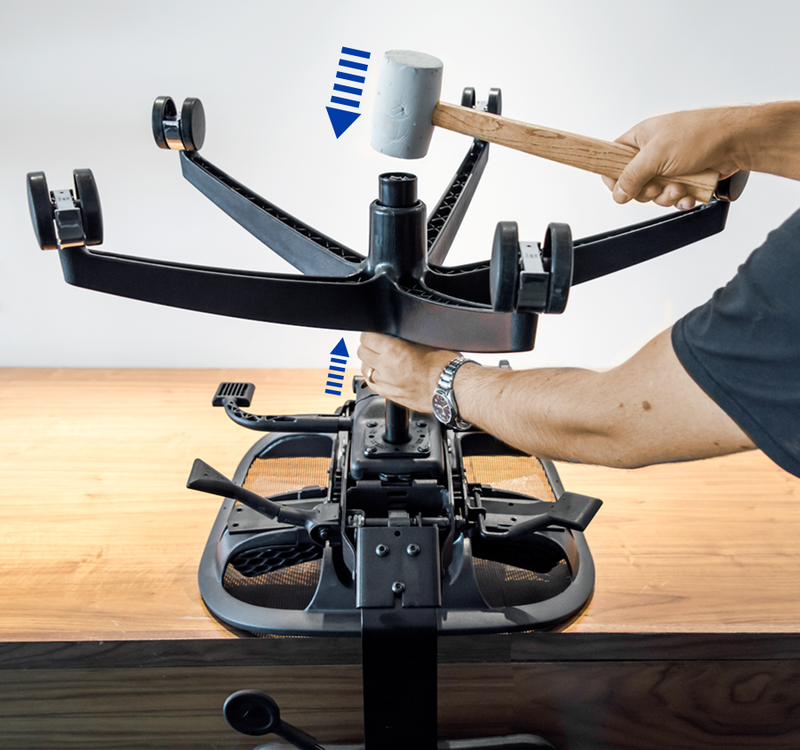 Then you need to hit the mechanism with a hammer or mallet *directly where or around where the lift is touching the mechanism*. 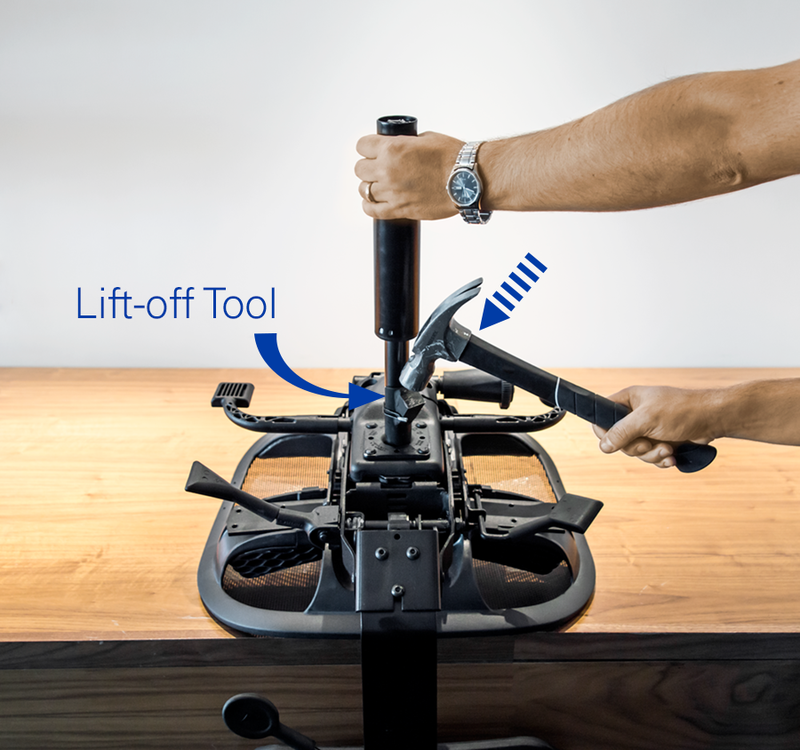 ergoCentric makes a tool called a “lift-off” which is a metal wedge that attaches around the gas lift, allowing you to hammer it on top and direct the force into a smaller area around the gas lift. If you hit it hard enough while lifting the gas lift, the vibrations will dislodge the lift from the hold in the bottom of the mechanism. There is another way to get it out while not using the lift off tool. 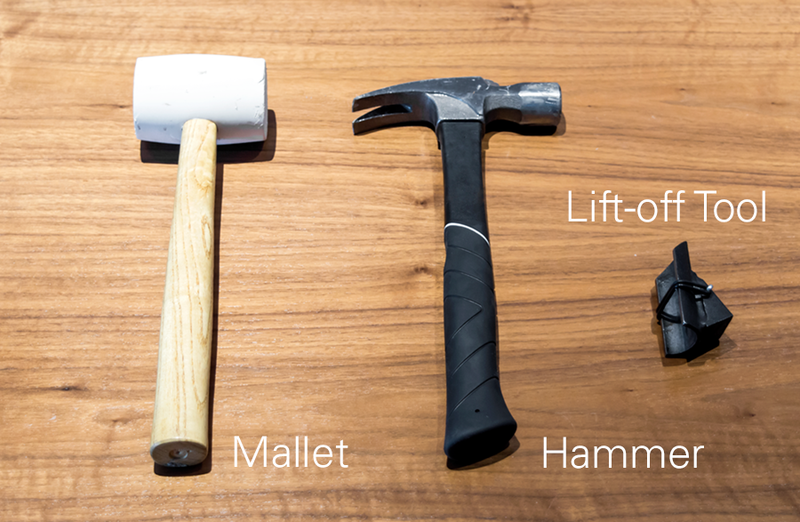 You would hit with a hammer, or a mallet, on the four corners of the mechanism around the lift, while pulling up on the gas lift. You then need to install the new pneumatic lift and reassemble the chair. Put the small end of the pneumatic lift (the top) into the hole in the bottom of the mechanism. You then slide the base onto the large end of the lift (the bottom). Turn the chair upright so it is sitting on the wheels and sit on it. The weight of your body is what locks the gas lift and the base into place. They pressure fit into place. Most mechanisms, pneumatic lifts and bases are a standard, generic size which all work together, so chances are, any office chair you have can be fixed with a standard pneumatic lift. You can buy pneumatic lifts, as well as lift offs, by calling customer service or an inside sales rep.
what you do if you do not have a list off tool ? I am wondering if replacement cylinders can be purchased in or around the Nanaimo, BC, Canada area. I have several ergoCentric office chairs in our probation office and several have lost the ability to stay elevated due to cylinder leaks. The serial #’s on the chairs are as follows: 448307, 448305, 448309 and 448301 if this is of assistance in determining the model purchased. The chairs were purchased several years ago as part of the Provincial Government renovation / replacement in our office. If cylinders are available, as well the replacement wedge identified above, I am hoping you may be able to supply me with a quote as to cost so that I may seek funding for the purchase. Yes, we will have a member of our Customer Service team follow-up with you shortly.